Maria “Happy” Haas Snively, 100, passed away January 30 at Aultman Compassionate Care. Her family from across the nation had been at her side for more than a week. Happy was born on January 4, 1919, in Carthage, Indiana, to Howard Earl and Willella Woodbridge Henley. After graduating from Earlham College and the University of Michigan, she married Dr. Max Haas in 1942. Once they moved to Massillon in 1947, she was active in the community for seven decades. Happy joined Central Presbyterian Church in 1948, where she served as a deacon and elder, the pianist for children’s choirs, and a longtime member of Rebekah Circle. She was a member of the Massillon Woman’s Club for 67 years. At Massillon City Hospital, she logged more than 3,000 volunteer hours with a cheerful smile at the reception desk. She impacted the community for many years on the boards of Massillon Public Library and the Charity School of Kendal Foundation. Along the way, she volunteered for other charitable organizations and supported good works and important local projects. 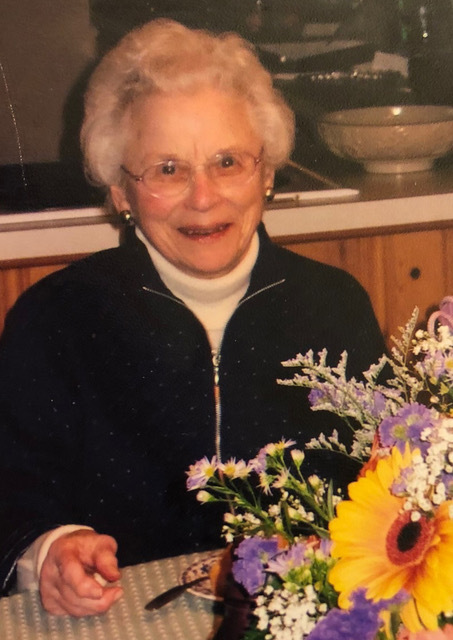 She regularly attended Canton Symphony Orchestra concerts and enjoyed playing bridge, sharing time on Sanibel Island with family and guests, and spending evenings with Massillon Club friends. She found special joy in hosting “Happy Hours” at her home with close friends and had a wonderful time there at her 100th birthday party. Happy, whose positive attitude uplifted everyone surrounding her, is remembered as a bright spirit who aptly selected her own nickname when she was in college. Happy was preceded in death by her husbands, Dr. Max Haas (1975) and Dr. James Snively (1999), and by her stepson Joe Snively (Linda DeVore). She is survived by sons Steve (Barbara) Haas, Menlo Park, CA; Jim (Karen) Haas, Erie, PA; and John (Margaret) Haas, San Diego, CA; daughter Susan (Pete) Wilson, Philadelphia, PA; stepsons Jim (Donna) Snively of Massillon and Tim Snively of Columbus; grandchildren Max Wilson, Bryan Wilson, Natalie (Yann) Haas, Brittany Haas, Katie (Alex) Haas-Conrad, Hannah Haas, Emma Haas, Robert (Heather) Hinckley, and Lisa Hinckley; and three great-grandchildren. Pastor Larry Lalama will officiate at memorial service to be held at 11:00 a.m.Saturday, May 18, 2019, at Central Presbyterian Church. The family will receive condolences one hour prior to the service, from 10-11:00 a.m. in the church. Memorial contributions to Central Presbyterian Church and Massillon Public Library would help perpetuate Happy’s legacy. There's still time to send flowers to the Visitation at the Central Presbyterian Church from 10:00 AM to 11:00 AM on May 18, 2019.